Should you wish either or both to attend an event or present or be interviewed please contact Sam at sam@ezeetrader.com or call 0044 (0)1252879500. You can find out more about future and previous events that they have attended below. Charlie appeared on BBC’s popular One Show in late 2017. Charlie was interviewed within the BBC2 Millions by the minute. You can watch the show and the follow up interview that Kym did with him by clicking the button below. Charlie has become a regular interviewer for what was TipTv but is now known as Core Finance. He has interviewed many of our clients and addressed the age old questions as how do traders succeed and the what steps they have taken to improve. You can watch most of these interviews by clicking the button below. Following on from Charlie’s appearance on the BBC2 programme he was interviewed by his local radio station. Charlie and Kym both regularly speak on these live webinar events. Both Charlie and Kym attend the London Investor Forex Show as key speakers. Charlie has taken part on each live trade off, winning 3 against other traders and drawing 1 against a computer! Charlie was interviewed by the Times following his appearance on the BBC show. Charlie and one of our clients was interviewed following the BB2 documentary. 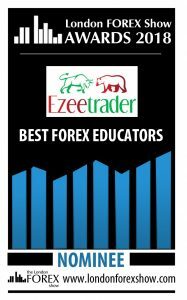 EzeeTrader have been nominated for the best forex educator in the 2018 London Forex Show.